Amazon has launched a new version of its flagship ereader, the Amazon Kindle Paperwhite, with a greatly enhanced display and better layouts. Starting at £109.99/$119 with special offers for the Wi-Fi only version, and rising to £179.99/$209.99 if you ditch offers and add 3G connectivity, the Paperwhite inherits the pricing structure of its name-sake predecessor. The main talking point on the all-new Kindle Paperwhite is its 6-inch display, which packs in two times more pixels resulting in a 300ppi density. That means text will look sharper than ever, and Amazon has also introduced a new font, Bookerly, which it hopes will be even easier on your eyes. 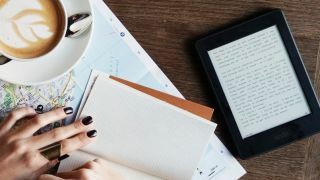 There's good news for authors too as Amazon has brought in a new typesetting engine, allowing more control over the layout of text on screen. In terms of design, size and weight there's not much of a difference between the 2013 and 2015 Paperwhite models, while Amazon claims it's still good for "weeks of battery life" - even with the higher resolution display and backlight. Prettier layouts, a new font and a higher resolution display - books are going to look great on the new Paperwhite. It's not an essential upgrade for current owners, but it looks like it will keep Amazon on top of the ereader game. You can pre-order the all new Kindle Paperwhite now, with stock expected to ship from June 30.